Posted on December 6, 2015 by revivewa	in Features, International Focus, Travel and Spirituality and tagged 1, feature. Brian is a member of the Black Pearl Network, a multi-congregation network of the Uniting Church WA dedicated to supporting the work of our church partners in Papua. He recently returned from a trip to Tanah Papua, the eastern most province of Indonesia, along with Kerry Povey from Trinity North Uniting Church, Lee-Anne Burnett from All Saints Floreat Uniting Church and myself, justice and mission officer for the Uniting Church WA. The beautiful and sometimes troubled province often referred to as ‘West Papua’ has become lodged firmly in the hearts of this small, but dedicated group. Through the Black Pearl Network (a name given to the group by the Papuans they work with), the Uniting Church WA supports a number of projects run by our partner church, Gereja Kristen Injili Indonesia (GKI). This trip was yet another chance to strengthen these relationships and continue the mutual learning the partnership provides. During our whirlwind week in Papua there were numerous fruitful discussions with both the staff of GKI and the STT University (an operation of GKI), regarding current and potential collaborations, including the redevelopment of the Angurruk Hospital in the Papuan highlands. The hospital has deteriorated over many years causing a reduction in the medical services now available. Through a grant provided by the local Papuan provincial government, the opportunity for a targeted redevelopment exists and members of the WA network have been requested to assist in its preparation. The team were also able to provide some much needed supplies for the Sara Clinic, run by the indomitable Mary Saud. Following a fire earlier in the year which saw most of the clinic burnt down, Mary still travels out to the districts to train midwives and nurses while the clinic is slowly being rebuilt. Appropriate medical equipment is hard to come by in Papua and so our donation of sterilised surgical supplies was gratefully received. In return, I was certainly a grateful recipient of the wonderful lunch we shared. Elvis Rumboy is another character with a determined will. Elvis runs a small water and sanitation organisation called LEMAK building toilets and wells for local families. With a very small budget and an even smaller team, Elvis is dedicated to bringing the benefit of fresh water and sanitation to as many communities as possible. We had a wonderful day with Elvis discussing training models to enable him to pass on his knowledge to other communities. As much as we enjoyed visiting with all these people and were continually humbled by the hospitality shown to us, it was clear that the most joy was gained when meeting with the former APCEP students. 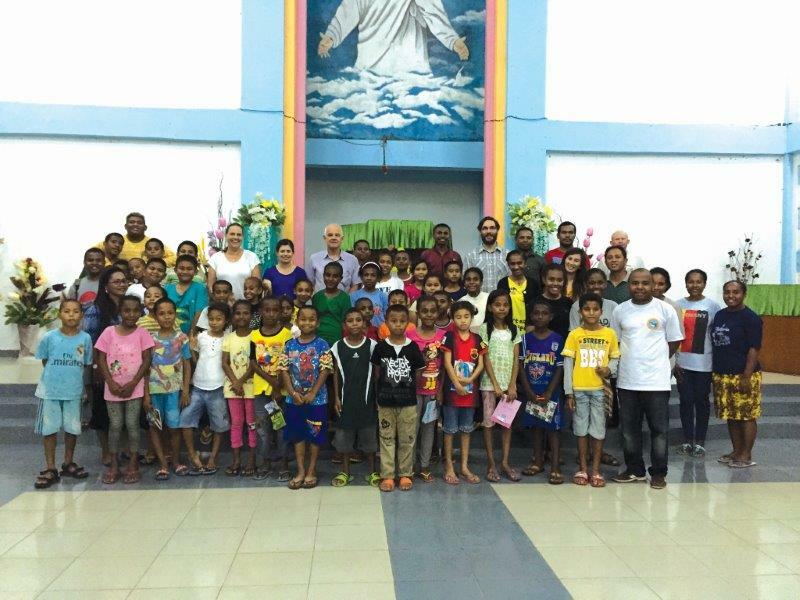 APCEP is the Australian Papuan Cultural Exchange Program which sees Uniting Churches across WA host Papuan students for an English immersion course. The strength of the relationships that develop through this exchange were obvious to see as the students continually came to visit, invited us to their churches and homes, and met us for dinner. While the benefit of the exchange for the students results in a vastly improved level of English, they do not hold this to themselves with many of the students now running their own basic English courses. Of course, as Brian accurately reminded us, the uplifting impact for us and our congregations reflects the true nature of the partnership as one of genuine exchange. We are all now quick to encourage other congregations across the WA Synod to join in this wonderful exchange of hope as we continue to share the journey with our Papuan friends. If you would like to find out more about how you might be able to be involved in the next APCEP course, contact the Justice and Mission Unit at the Uniting Church WA on 9260 9800. Top Image: Geoff Bice, Kerry Povey and Lee-Anne Burnett presenting donated medical supplies to Rev Hermann (centre) and Mary Saud (right) at the Sara Clinic in Tanah Papua.